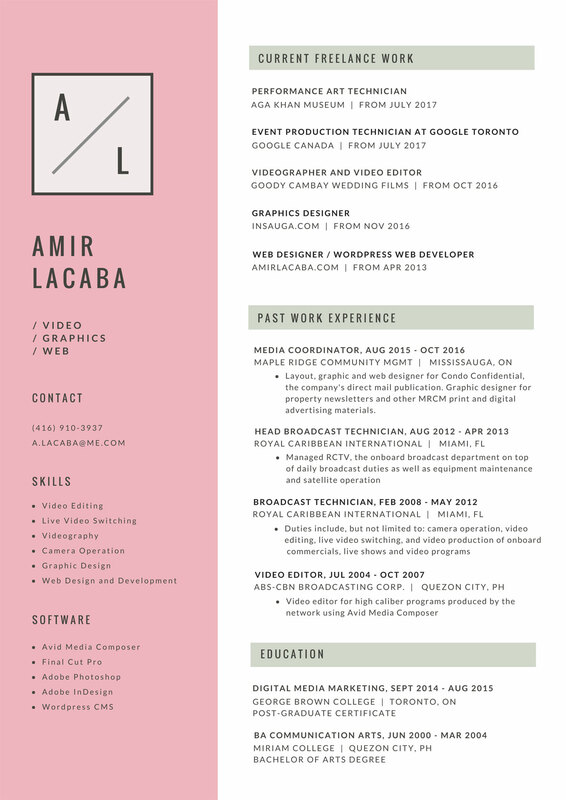 I’m a video specialist, web and graphic designer with 15 years of experience. In my downtime, I’m an avid traveller, reader, gamer and occasional TV couch potato. I also enjoy listening to audiobooks and podcasts while I’m in transit. My favourites are Criminal and This American Life. My work experience include working for Royal Caribbean International as a Broadcast Technician and soon after, a Head Broadcast Technician. I’ve had the pleasure of working onboard one of the two biggest cruise ships in the world, Oasis of the Seas and Allure of the Seas. I do everything from live switching and robotic camera operation, to filming and editing various events onboard. I have also worked for ABS-CBN, the biggest network company in my home country, as an Avid Video Editor. This gave me the chance to be part of the creation of top television programs in the Philippines. Currently, I’m a freelance video specialist based in Toronto/GTA as well as a graphics and web designer specialising in WordPress CMS. Editor-in-Chief for Condo Confidential, the company’s direct mail publication. Assistant to the IT Manager and provided technical support in the head office.